Typically we can start installing a stair within 1-4 weeks from the initial estimate. This timing depends on the following: Size & Complexity of the stair, special order requirements, whether or not the stair is to be pre-finished/primed and the customer or builders schedule. We set an actual install date when we have received a reviewed and signed contract along with the specified deposit. We are also happy to work within the customer's schedule. Do you sell stair parts only? No. We also provide consultation, design, installation, and finishing services. At this time we do not accept credit cards. Price is always a part of the design process. This is why we offer a free In-Home consultation to try to match your needs and budget to material and services we provide. One of our friendly and qualified sales people will walk you through every step of the layout, and design process. Staircases can run anywhere from a $600 utility stair, to exotic and elaborate stairs costing tens of thousands of dollars. 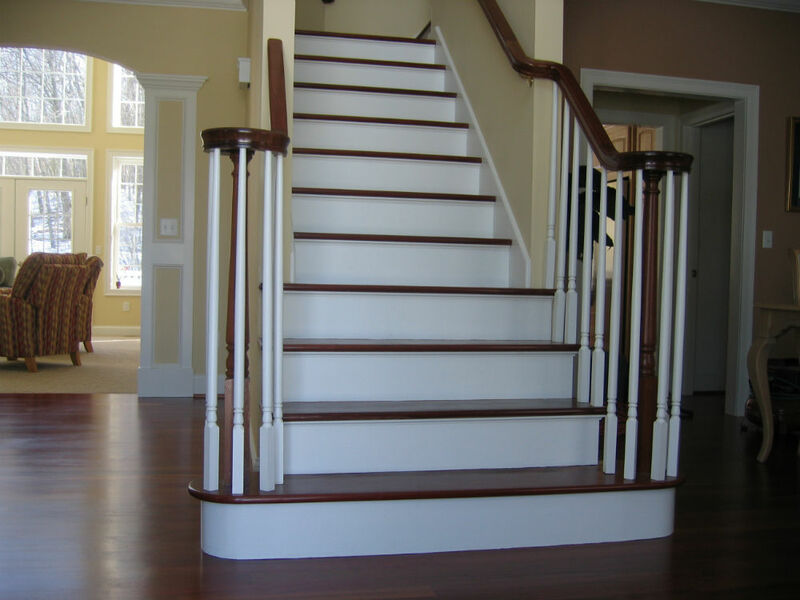 We offer it all, custom stairs ranging from utilitarian to artisan. Yes. We offer custom "pre-finish" and "full-finish" options to every customer. We will provide you with our best approximation of an installation time when an install date is set. Can the parts be delivered or picked up for pre-painting by others? Yes. We are very flexible and always strive to make the stair-building process as smooth and painless for the customer as possible. Can you give me a price from pictures or blueprints? We will give you as close of an estimate as possible based on the information that you provide us. Our estimates are good for 90 days, and are only as accurate as the amount and accuracy of information that you provide to us. We work with most woods as well as wrought iron and glass. Please see our gallery of some of our past completed projects. Do you work outside of Connecticut? Yes. We work in CT, MA, and RI.